Cape buffalo, Congo buffalo, dwarf forest buffalo, Buffle d'Afrique, Afrikanischer Büffel, Kaffernbüffel, Nyati, Mbogo. Depending on the subspecies, African buffalo range in color from dark brown or black (in savannah-living races) to bright red (forest buffalo). The body is heavy-set, with stocky legs, a large head, and short neck. 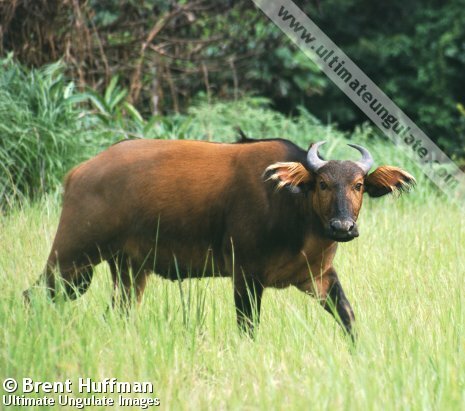 There are no distinct markings on the body, although forest buffalo tend to darken with age and may thus have dark patches mingled with the red base color. 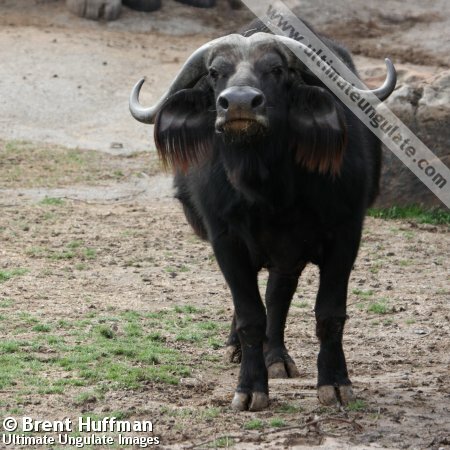 The ears are large and tend to droop; they are edged by a long fringe of hairs, including two white tufts in forest buffalo. Both male and female African buffalo have horns; in savannah buffalo, these are hook-shaped, curving first downwards and then hooking up and inwards, and growing up to 160 cm long. The horns of males are larger than females, and in males the bases of the horns expand into a known as a "boss". 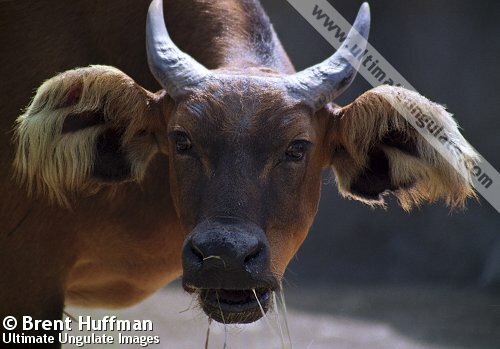 Forest buffalo have much shorter horns (no more than 40 cm long) which are relatively straight and which sweep backwards in line with the forehead. 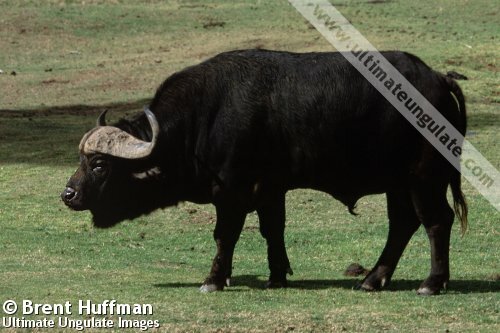 The Asian water buffalo (Bubalus arnee) has a lighter build than the African buffalo, and has long saber-like horns. Domestic water buffalo (Bubalus bubalis), however, tend to be more heavy set and may have shorter horns with curled tips. 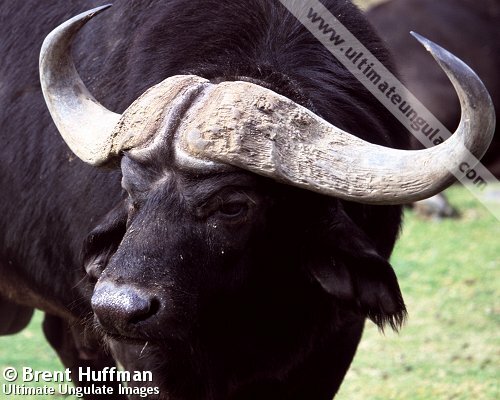 The horns of water buffalo are triangular in cross-section with strong keels (the horns of African buffalo are rounded in cross-section, especially towards the tips); male water buffalo never develop a boss at the horn base. Life span: Typically 18-20, up to 29 in captivity. African buffalo will breed year-round if conditions allow, but where water is scarce most births occur during the wet season. At birth, the calf is lighter than the adults; baby savannah buffalo are usually dark reddish-brown, while baby forest buffalo are usually bright red. African buffalo may be active throughout the day and night; on average, 18 hours per day are spent foraging and moving. Herds usually occupy a stable home range; in savannah buffalo, these areas may be 126 to 1,075 square kilometers in size. African buffalo are formidable animals on account of their large size, large herds, and large horns. Herds will stick together and may charge as a unit when threatened, a tactic which ensures that predators have difficulty preying on even young and feeble animals. Oxpeckers and cattle egrets are birds which frequently accompany buffalo, feeding on insects flushed from the grass as the buffalo walk and also eating biting insects from the buffalo's skin. Regular use of mud wallows also helps protect buffalo from insects. Family group: Savannah buffalo live in large herds of 50-500 animals, comprised of smaller subgroups of bachelor males, females and their young, or juveniles. Old males may be solitary. 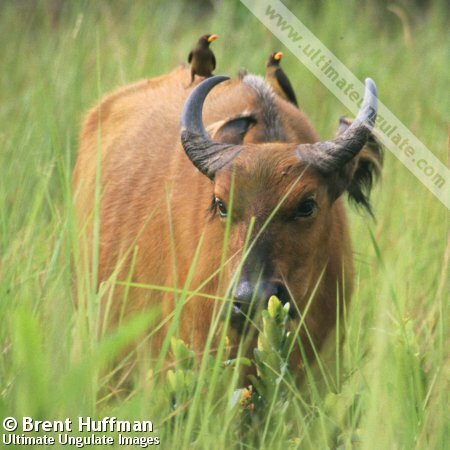 Forest buffalo live in smaller mixed herds of 8-20 animals. African buffalo are found in a variety of habitats, including open savannah, woodlands, and rainforest. Once ranging widely in sub-Saharan Africa, the distribution of this species has shrunk due to hunting and disease issues. The approximate range is depicted in the map below. Threats: Hunting by humans for meat and trophies, habitat loss, and introduced disease (especially rinderpest). The estimated total population is just under one million animals, although this species is in decline over most of its range.